Catherine I (Russian: Екатери́на I Алексе́евна, tr. Yekaterina I Alekseyevna, born Polish: Marta Helena Skowrońska, later known as Marta Samuilovna Skavronskaya; 15 April [O.S. 5 April] 1684 – 17 May [O.S. 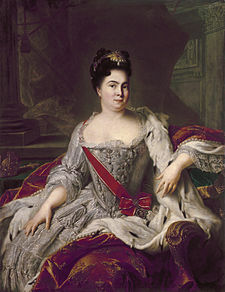 6 May] 1727) was the second wife of Peter the Great and Empress of Russia from 1725 until her death. The life of Catherine I was said by Voltaire to be nearly as extraordinary as that of Peter the Great himself. There are no documents that confirm her origins. Said to have been born on 15 April 1684 (o.s. 5 April), she was originally named Marta Helena Skowrońska. Marta was the daughter of Samuel Skowroński (later spelt Samuil Skavronsky), a Roman Catholic peasant from the Polish–Lithuanian Commonwealth born to Minsker parents, who in 1680 married Dorothea Hahn at Jakobstadt. Her mother is named in at least one source as Elizabeth Moritz, the daughter of a Baltic German woman and there is debate as to whether Moritz's father was a Swedish officer. It is likely that two stories were conflated, and Swedish sources suggest that the Elizabeth Moritz story is probably incorrect. Some biographies state that Marta's father was a gravedigger and handyman, while others speculate that he was a runaway landless serf. Marta's parents died of the plague around 1689, leaving five children. According to one of the popular versions, at the age of three Marta was taken by an aunt and sent to Marienburg (the present-day Alūksne in Latvia, near the border with Estonia and Russia) where she was raised by Johann Ernst Glück, a Lutheran pastor and educator who was the first to translate the Bible into Latvian. In his household she served as a lowly servant, likely either a scullery maid or washerwoman. No effort was made to teach her to read and write and she remained illiterate throughout her life. Marta was considered a very beautiful young girl, and there are accounts that Frau Glück became fearful that she would become involved with her son. At the age of seventeen, she was married off to a Swedish dragoon, Johan Cruse or Johann Rabbe, with whom she remained for eight days in 1702, at which point the Swedish troops were withdrawn from Marienburg. When Russian forces captured the town, Pastor Glück offered to work as a translator, and Field Marshal Boris Sheremetev agreed to his proposal and took him to Moscow. There are unsubstantiated stories that Marta worked briefly in the laundry of the victorious regiment, and also that she was presented in her undergarments to Brigadier General Rudolph Felix Bauer, later the Governor of Estonia, to be his mistress. She may have worked in the household of his superior, Sheremetev. It is not known whether she was his mistress, or household maid. She travelled back to the Russian court with Sheremetev's army. Afterwards she became part of the household of Prince Alexander Menshikov, who was the best friend of Peter the Great of Russia. Anecdotal sources suggest that she was purchased by him. Whether the two of them were lovers is disputed, as Menshikov was already engaged to Darya Arsenyeva, his future wife. It is clear that Menshikov and Marta formed a lifetime alliance. It is possible that Menshikov, who was quite jealous of Peter's attentions and knew his tastes, wanted to procure a mistress on whom he could rely. In any case, in 1703, while visiting Menshikov at his home, Peter met Marta. In 1704, she was well established in the Tsar's household as his mistress, and gave birth to a son, Peter. In 1705, she converted to Orthodoxy and took the new name of Catherine Alexeyevna (Yekaterina Alexeyevna). She and Darya Menshikova accompanied Peter and Menshikov on their military excursions. Though no record exists, Catherine and Peter are described as having married secretly between 23 Oct and 1 Dec 1707 in St. Petersburg. They had twelve children, two of whom survived into adulthood, Anna (born 1708) and Yelizaveta (born 1709). Peter had moved the capital to St Petersburg in 1703. While the city was being built he lived in a three-room log cabin with Catherine, where she did the cooking and caring for the children, and he tended a garden as though they were an ordinary couple. The relationship was the most successful of Peter's life and a great number of letters exist demonstrating the strong affection between Catherine and Peter. As a person she was very energetic, compassionate, charming and always cheerful. She was able to calm Peter in his frequent rages and was called in to attend him during his epileptic seizures. Catherine went with Peter on his Pruth Campaign in 1711. There Catherine was said to have saved Peter and his Empire, as related by Voltaire in his book Peter the Great. Surrounded by overwhelming numbers of Turkish troops, Catherine suggested before surrendering, that her jewels and those of the other women be used in an effort to bribe the Ottoman grand vizier Baltacı Mehmet Pasha into allowing a retreat. Mehmet allowed the retreat, whether motivated by the bribe or considerations of trade and diplomacy. In any case Peter credited Catherine and proceeded to marry her again (this time officially) at Saint Isaac's Cathedral in St. Petersburg on 9 February 1712. Catherine was Peter's second wife; he had previously married and divorced Eudoxia Lopukhina, who had borne him the Tsarevich Alexis Petrovich. Upon their wedding, Catherine took the style of her husband and became Tsarina. When Peter elevated the Russian Tsardom to Empire, Catherine became Empress. The Order of Saint Catherine was instituted by her husband on the occasion of their wedding. Upon Peter's death, Catherine found her four siblings, Krystyna, Anna, Karol and Fryderyk, gave them the newly created titles of Count and Countess, and brought them to Russia. Krystyna Skowrońska, renamed Christina (Russian: Христина) Samuilovna Skavronskaya (1687 – 14 April 1729), had married Simon Heinrich (Russian: Симон Гейнрих) (1672–1728) and their descendants became the Counts Gendrikov [ ru ]. Anna Skowrońska, renamed Anna Samuilovna Skavronskaya, had married one Michael-Joachim N and their descendants became the Counts Efimovsky. Karol Skowroński, renamed Karel Samuilovich Skavronsky, was created a Count of the Russian Empire on 5 January 1727 and made a Chamberlain of the Imperial Court; he had married Maria Ivanovna, a Russian woman, by whom he had descendants who became extinct in the male line in 1793. Fryderyk Skowroński, renamed Feodor Samuilovich Skavronsky, was created a Count of the Russian Empire on 5 January 1727 and was married twice: to N, a Lithuanian woman, and to Ekaterina Rodionovna Saburova, without having children by either of them. In 1724 Catherine was officially crowned and named co-ruler. The year before his death, Peter and Catherine had an estrangement over her support of Willem Mons, brother of Peter's former mistress Anna, and brother to one of the current ladies in waiting to Catherine, Matryona Balk. He served as secretary to Catherine. Peter had fought his entire life to clear up corruption in Russia. Catherine had a great deal of influence on who could gain access to her husband. Willem Mons and his sister Matrena had begun selling their influence to those who wanted access to Catherine and, through her, to Peter. Apparently this had been overlooked by Catherine, who was fond of both. Peter found out and had Willem Mons executed and his sister Matrena exiled. He and Catherine did not speak for several months. Rumors flew that she and Mons had had an affair, but there is no evidence for this. Peter died (28 January 1725 Old Style) without naming a successor. Catherine represented the interests of the "new men", commoners who had been brought to positions of great power by Peter based on competence. A change of government was likely to favor the entrenched aristocrats. For that reason during a meeting of a council to decide on a successor, a coup was arranged by Menshikov and others in which the guards regiments with whom Catherine was very popular proclaimed her the ruler of Russia, giving her the title of Empress. Supporting evidence was "produced" from Peter's secretary Makarov and the Bishop of Pskov, both "new men" with motivation to see Catherine take over. The real power, however, lay with Menshikov, Peter Tolstoy and with other members of the Supreme Privy Council. She died two years after Peter, at age 43, in St. Petersburg, where she was buried at St. Peter and St. Paul Fortress. Tuberculosis, diagnosed as an abscess of the lungs, caused her early demise. Catherine was the first woman to rule Imperial Russia, opening the legal path for a century almost entirely dominated by women, including her daughter Elizabeth and granddaughter-in-law Catherine the Great, all of whom continued Peter the Great's policies in modernizing Russia. At the time of Peter's death the Russian Army, composed of 130,000 men and supplemented by another 100,000 Cossacks, was easily the largest in Europe. However, the expense of the military was proving ruinous to the Russian economy, consuming some 65% of the government's annual revenue. Since the nation was at peace, Catherine was determined to reduce military expenditure. For most of her reign, Catherine I was controlled by her advisers. However, on this single issue, the reduction of military expenses, Catherine was able to have her way. The resulting tax relief on the peasantry led to the reputation of Catherine I as a just and fair ruler. The Supreme Privy Council concentrated power in the hands of one party, and thus was an executive innovation. In foreign affairs, Russia reluctantly joined the Austro-Spanish league to defend the interests of Catherine's son-in-law, the Duke of Holstein, against Great Britain. Catherine gave her name to Catherinehof near St. Petersburg, and built the first bridges in the new capital. She was also the first royal owner of the Tsarskoye Selo estate, where the Catherine Palace still bears her name. She also gave her name to Kadriorg Park and the later neighbourhood of Tallinn, Estonia, which today houses the Presidential Palace of Estonia. In general, Catherine's policies were reasonable and cautious. The story of her humble origins was considered by later generations of tsars to be a state secret. ^ a b c Hughes 2004, p. 131. ^ a b c d e f Hughes 2004, p. 135. ^ a b Hughes 2004, p. 136. ^ Lincoln 1981, p. 164. ^ a b Lincoln 1981, p. 168. ^ Lincoln 1981, p. 168-169. Hughes, Lindsey (2004). "Catherine I of Russia, Consort to Peter the Great". In Campbell Orr, Clarissa. Queenship in Europe 1660-1815: The Role of the Consort. Cambridge University Press. pp. 131–154. ISBN 0-521-81422-7. Lincoln, W. Bruce (1981). The Romanovs. New York: Dial Press. Massie, Robert K (1980). Peter the Great. New Jersey: Random House. "Catherine I." . Encyclopædia Britannica (11th ed.). 1911. "Catharine I." . New International Encyclopedia. 1905. Peter II Alexeyevich reigned as Emperor of Russia from 1727 until his death. He was the only son of Tsarevich Alexei Petrovich and of Charlotte Christine of Brunswick-Lüneburg. Count Mikhail Illarionovich Vorontsov was a Russian statesman and diplomat, who laid foundations for the fortunes of the Vorontsov family. Prince Aleksander Danilovich Menshikov was a Russian statesman, whose official titles included Generalissimus, Prince of the Russian Empire and Duke of Izhora, Prince of the Holy Roman Empire, Duke of Cosel. A highly appreciated associate and friend of Tsar Peter the Great, he was the de facto ruler of Russia for two years. Nikolai Petrovich Sheremetev was a Russian count, the son of Petr Borisovich Sheremetev, notable grandee of the epoch of empresses Anna Ivanovna, Elizabeth Petrovna, and Catherine II. He was also the grandson of Boris Petrovich Sheremetev. Boris Petrovich Sheremetev was a Russian diplomat and general field marshal during the Great Northern War. He became the first Russian count in 1706. His children included Pyotr Sheremetev and Natalia Sheremeteva. 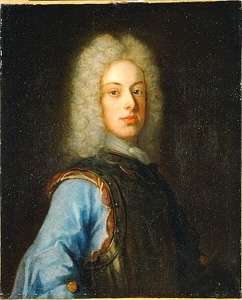 Duke Charles Frederick of Schleswig-Holstein-Gottorp was a Prince of Sweden and Duke of Schleswig-Holstein-Gottorp and an important member of European royalty. His dynasty, the Dukes of Schleswig-Holstein-Gottorp, were a cadet branch of the ancient House of Oldenburg, which at that time was ruling Denmark. His mother was a sister of Charles XII of Sweden. Charles Frederick married a daughter of Peter the Great and became the father of the future Peter III of Russia. As such, he is the progenitor of the Russian imperial house of Holstein-Gottorp-Romanov and the patrilineal ancestor of all Russian emperors starting with Peter III, except for Catherine II. Grand Duchess Anna Petrovna of Russia, Tsesarevna of Russia Russian: Анна Петровна; 27 January 1708, in Moscow – 4 March 1728, in Kiel) was the elder daughter of Emperor Peter I of Russia and Empress Catherine I of Russia. Her sister, Elizabeth of Russia, ruled as Empress between 1741 and 1762. While a potential heir in the reign of her father and her mother, she never acceded to the throne due to political reasons. However, her son Peter would rule as Emperor in 1762, succeeding Elizabeth. She was the Duchess of Schleswig-Holstein-Gottorp by marriage. Grand Duchess Alexandra Petrovna of Russia was a great-granddaughter of Emperor Paul I of Russia and the wife of Grand Duke Nicholas Nikolaevich of Russia, the elder. Grand Duchess Natalia Petrovna of Russia was the youngest daughter of Peter the Great and his second wife Catherine I. Grand Duchess Natalya Alexeyevna of Russia was a Russian Grand Duchess. Countess Anna Karlovna Vorontsova, née Countess Skavronskaya, was a Russian lady in waiting, salonist and noble, cousin of the Empress Elizabeth of Russia. She was married to Chancellor Count Mikhail Illarionovich Vorontsov. Prince George Maximilianovich Romanowsky, 6th Duke of Leuchtenberg, also known as Prince Georgii Romanovsky or Georges de Beauharnais, was the youngest son of Maximilian de Beauharnais, 3rd Duke of Leuchtenberg and his wife, Grand Duchess Maria Nikolaevna of Russia. Duke Constantine Frederick Peter of Oldenburg was a son of Duke Peter Georgievich of Oldenburg and his wife Princess Therese of Nassau-Weilburg Known in the court of Tsar Nicholas II as Prince Constantine Petrovich Oldenburgsky, he was the father of the Russian Counts and Countesses von Zarnekau. Countess Anna Ivanovna Tolstaya, née Princess Baryatinskaya was the sister of prince Ivan Baryatinsky, wife of Marshal Nikolai Alexandrovich Tolstoy (1765–1816), a close friend of the Empress Elizabeth Alexeyevna and memoirist Countess Varvara Golovina. Countess Catherine Shuvalova,, was a Russian courtier, Empress Catherine II's Lady-in-waiting of the Imperial Court of Russia, confidant of Platon Zubov and Ober-Hofmeisterin of the Grand Duchess Elizabeth Alexeievna. She was the daughter of Field Marshal Earl Pyotr Saltykov. Princess Alexandra Ivanovna Kurakina, nee Panina was the daughter of Lieutenant-General and Senator Ivan Panin, the sister of the famous counts Nikita and Peter Panin, the grandmother of Princes Alexander and Alexey Kurakin and poet Yury Neledinsky-Meletsky.